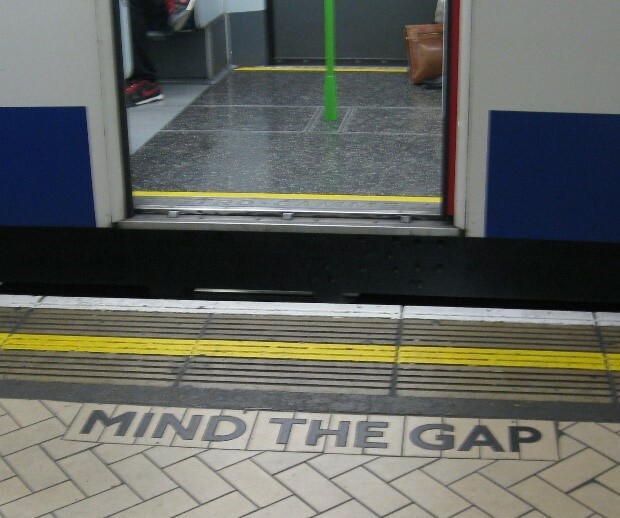 If you’ve ever ridden on the London Underground, you’re familiar with the famous phrase, “Mind the Gap” — a caution to rail passengers to be careful while crossing the gap between the train and the station platform. There’s a lesson there: Potentially dangerous gaps are much more safely and easily navigated when we’re conscious of them, but it’s the unconscious gaps that get us into trouble. The width of the gap between stimulus and response, and our subsequent power to choose, is dependent on our conscious awareness of it. The more conscious we are of the gap, the wider it becomes and the more choice we have in how we respond, what we do and how we behave. Therefore, before we focus on what we do inside that gap, it’s imperative that we first learn how to widen the gap itself. By widening the gap — in other words, increasing our conscious awareness of the fact that we have a choice in our responses to stimuli — our choices usually take care of themselves. It’s relatively rare that we make poor choices consciously; most of our poor choices are made unconsciously and we don’t fully realise it until after the consequences unfold. So how, exactly can we widen the gap? As we all know too well, life tends to come at us very quickly. The more caught up in life we become, the more we are likely to find ourselves getting caught up in a rhythm and flow that life is handing us, often responding to events more quickly, and with less thought than we would like. Wouldn’t it be great if we could slow things down a bit and make decisions coming from a place of a little more thought and awareness? Don’t you sometimes just wish that you could “stop the tape” and pause before making an important decision or taking an action, giving yourself a little time to do the right thing? Victor Frankl, mentioned in the quote above, was a Viennese psychiatrist who survived concentration camp during the Second World War. One of the ways he survived was through separating himself from the horrors in front of him by asking himself questions, pausing to see the larger picture, thereby detaching himself from impulsive thoughts and poorly thought-out actions. He not only chose more prudent behaviours, but he also consciously chose how he thought- and therefore felt- about what he was experiencing. He learned that pausing to ponder and consider his choices with regards to processing and thinking about external events made all the difference in how he experienced his world. Trying to identify this pause when you are enjoying yourself in an activity that you love, doing something that is stressful, absorbed in something – anything that you find yourself getting caught up in. STOP, BREATHE, and NOTICE what you are experiencing in a non-judgmental way. Savour the feeling for a few moments, becoming aware of what is going on and how you are physically and emotionally. If it’s something noncritical or enjoyable, go back to it when you are ready. If it is something that is stressful or more crucial to your life, take a little more time in that space. Over time you will develop a rational detachment which will allow you to enjoy some things more and allow you to make better decisions with others. In either case, time will appear to be a little bit slower, giving you a greater capacity to act in a way that you will be more comfortable with. Start learning to recognize this space between stimulus and response. Learn to utilize this pause and to recognize what is really going on, as opposed to what you think is going on, or perhaps becoming aware of something you had previously not even noticed. Increased awareness supports a decrease in stress. Try as we may to be mature, conscious, and wise about our responses, it is inevitable we’re going to jump into the gap without thinking from time to time! For example, we’re going to react angrily when someone pushes in; we’re going to act defensively with our spouses/friends in the heat of an argument. We can’t take those moments back, but what we can do is reflect on them after the event, with honesty and personal responsibility. We can ask ourselves: What was going on for me in that moment? What did I do to contribute to that? What can I do now to improve the situation? The more we’re willing to take an honest look at the circumstances, events, and conflicts in our lives, the greater our ability to ‘widen the gap’ in the future. This is not about shame or blame — it’s about empowerment.